For more than 32 years, Stephen and Ondrea Levine have provided emotional and spiritual support to those who face life-threatening illness and their caregivers; deeply affecting hundreds of thousands of people in the process. The Healing I Took Birth For, which was begun after Ondrea�s own medical prognosis that foretold the end of a lifetime of spiritual exploration, is the culmination of her work. Their collaboration, in the service of the dying, especially during the height of the AIDS epidemic, set them both more deeply on the path of compassion�compassion for self, for others, for all. 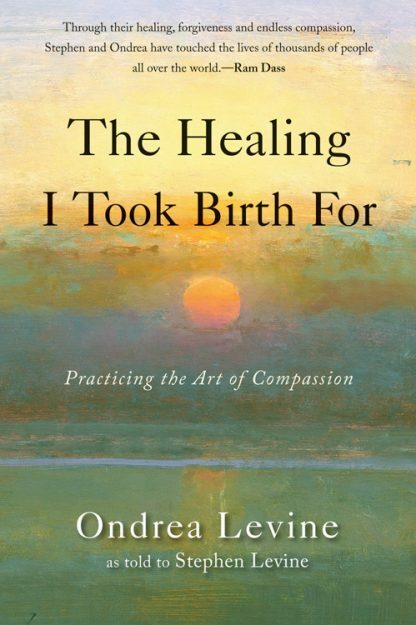 The Healing I Took Birth For is the heartfelt sharing of Ondrea�s life of service and a deeply inspiring example of how one faces illness and great personal difficulties, with a deep spiritual practice and grace. It is the most �intimate collaboration� she and Stephen have worked on and it will inspire readers to find their own way toward living a life of compassion. Ondrea Levine and Stephen Levine are close collaborators in teaching, in practice, in life. Together they are the authors of more than eight books, some of which bear Stephen's name only as author, but all of which Ondrea had a hand in. Together they are best known for their work on death and dying. They are also the parents of Buddhist teacher and writer Noah Levine.